Though it is debated whether it was the American cultural anthropologist Margaret Mead who first spoke these much-quoted words, it cannot be disputed that they indeed are very true. Little did I know last November when I presented an environmental campaign idea for the Ronda city hall that half a year later we would be celebrating our first annual Día de Ronda Limpia. 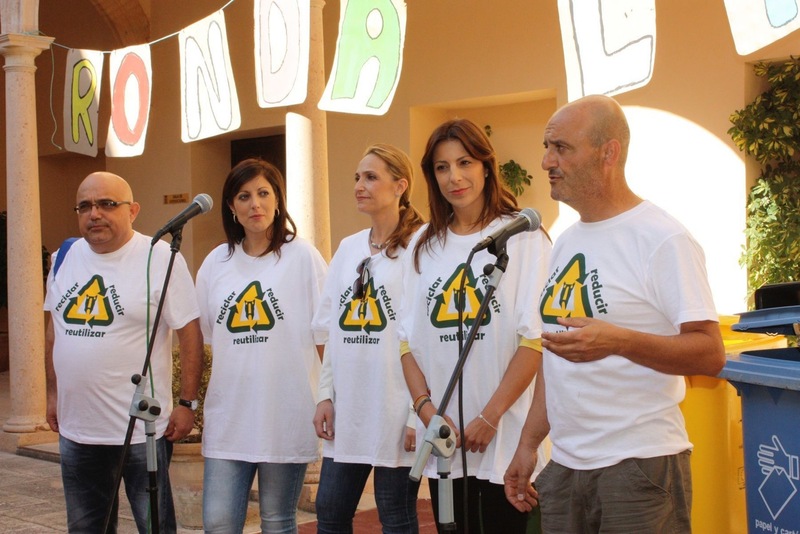 Ronda Limpia is a community movement for a cleaner Ronda – as simple as that. 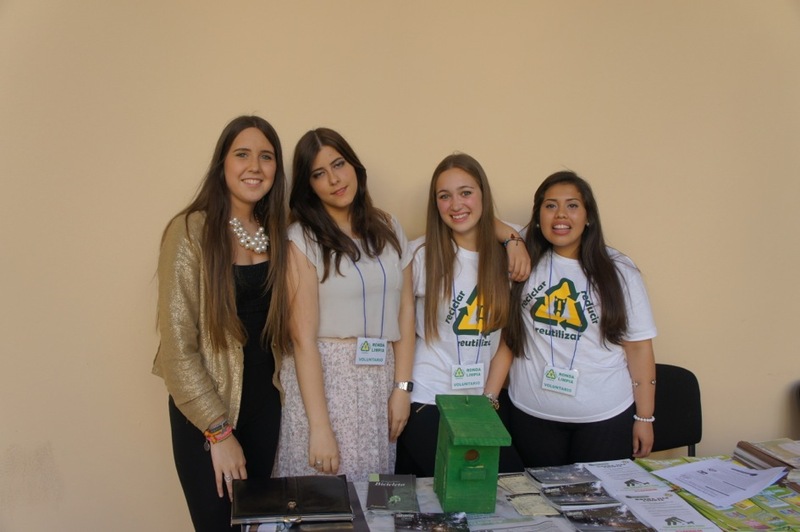 It is the joint effort of the environmental delegation or Medio Ambiente of Ronda and a few dedicated volunteers. In the months since we started we have established weekly guerilla-style symbolic cleanups of public areas, monthly diplomas to the ‘green entity’ of the month, communication and education through regular press releases, social media blasts and blog posts on our Ronda Limpia web site. 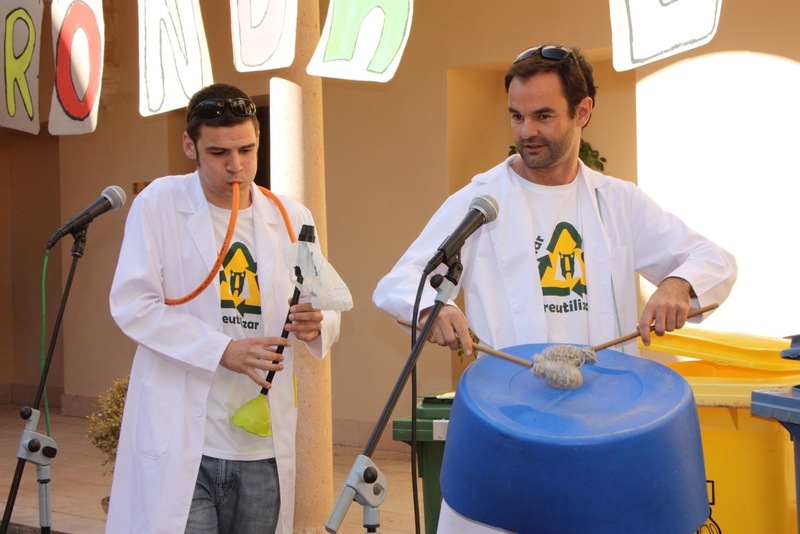 And finally, we have created not only Ronda’s, but also Andalucía’s first day celebrating, educating and inspiring the 3 R’s – Reduce, Reuse and Recycle. Having organized several art exhibits and non-profit fundraisers in Vancouver, BC, I was curious about how it would be to help organize an event here in rural Spain. Clearly the audience potential is much smaller in a town of 40.000 inhabitants than in a metropolitan city of Vancouver with more than 2.2 million people. But smaller certainly has it advantages. Take for instance the competition for local news. Regardless of how successful our event would be in Vancouver, with celebrity performers and five figures raised in one single evening, we would hardly ever be mentioned in the local press. We simply weren’t newsworthy enough. Here in Ronda I am pleased to say that due to the lack of major crimes and other groundbreaking news, we have been amply awarded with local press coverage for every one of our press releases and public presentations. Equally, finding a decent event venue in a city like Vancouver is a very costly affair that slashes deep into many an organization’s fund- and awareness-raising efforts. Yet here in Ronda we were lent the city’s very best venue, the world-class Palacio de Congresos, in the busiest month of the year without having to pay a single céntimo. Hearing this one would think that organizing events in Spain basically happens all on its own while one peacefully enjoys ones extended siesta, sangria in hand. Of course this is not the case. Whereas in Vancouver I could find a hundred educated, committed and hard-working event volunteers by putting a single ad on ‘Go Volunteer’, here in rural Spain the concept of volunteering and the duty to ‘give back’ is not that deeply engraved in the public psyche. Added to this, the Spanish sense of time is a whole chapter to itself. So, though we had 27 volunteers signed up to help from just one high schools alone, barely a handful people showed up at our volunteer information meeting the wk prior to the event. Granted this is exam time for high school students, but I doubt that was teh real rreason. A couple of families (and friends, of course…) helped set up the entire event, while we feared we would never be ready on time. The morning of the event, the same group was still making signs and preparing the art exhibit until minutes before the doors opened. But we managed, and Lord and behold, as the event started and people bgan steaming in, so did the smiling volunteers, by the dozen! 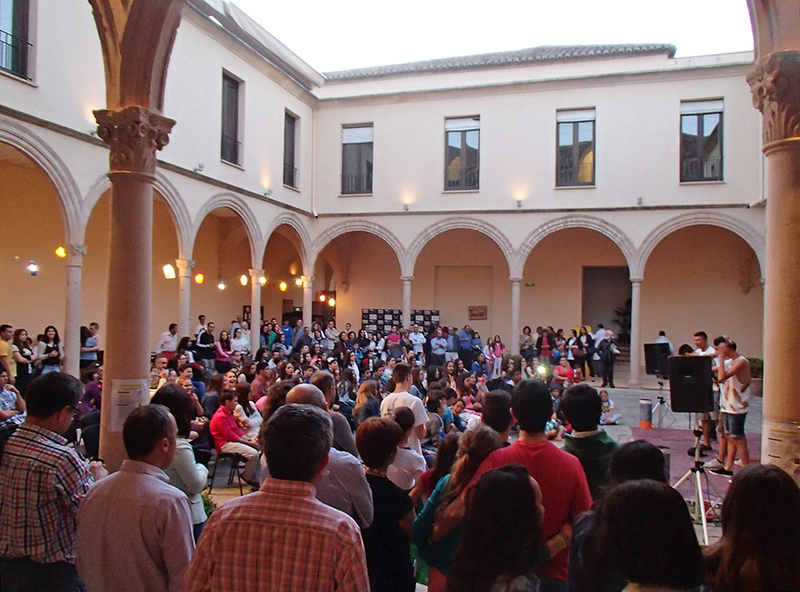 For our very first public event, and with no prior track record, the 2014 día de Ronda Limpia went immensely well. We guesstimated having a couple of thousand visitors, all without printing a single poster to pollute our city! Aided and brought to Ronda by the Casa de la Cultura, a Cordoba based group called Vibra-tó gave an amazing musical performance with recycled instruments, as well as a workshop on how to make your very own clarinet, flute or string instrument from hoses, toilet plungers, dustpans and other discarded household items. The local Hip Hop group ‘The Dreamers’ sang “eres boootiiifooool” to a sea of whooping local teenage groupies and a procession of ‘clean’ dogs and recycling magicians helped make the day an unforgettable one. 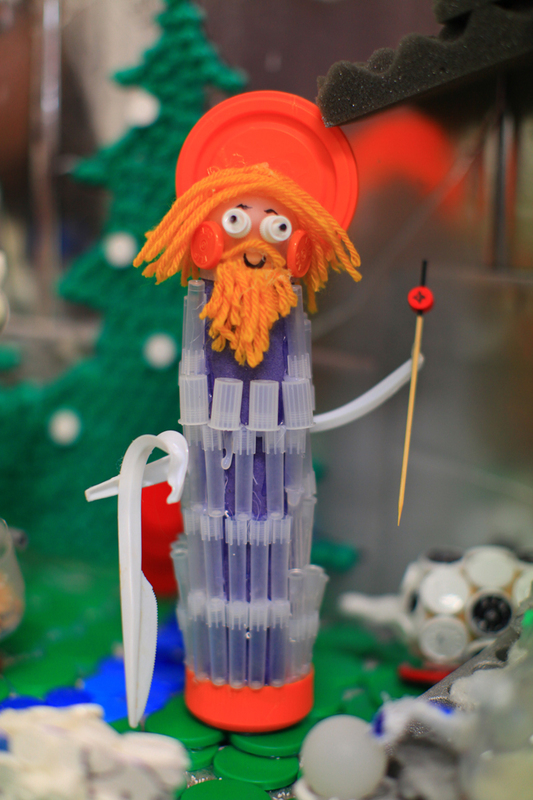 The excibit of participating works from the recycled art competition showcased more than one hundred sculptures, utilities and drawings from local citizens and artists from as far away as Canada and the USA. We counted 783 audience votes for their favourite pieces of art. 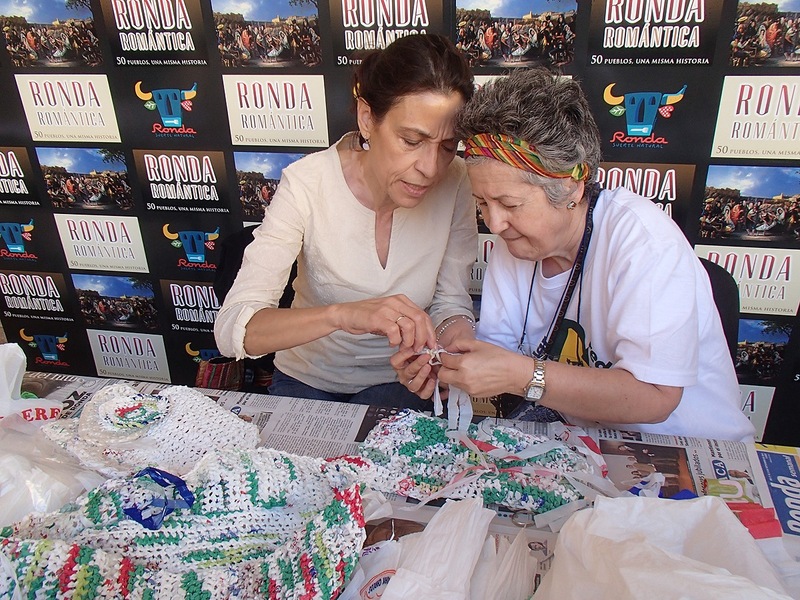 Even two members of my own furniture restoration class (and active members of the Ladies of Ronda Dumpster Diving Society…), Lola and Crescencia, held a workshop on how to knit baskets and othr items out of old plastic bags. By the way, Crescencia’s piece, a decoupaged chair covered in newspaper clipping, should have won the best name award, had we had it. 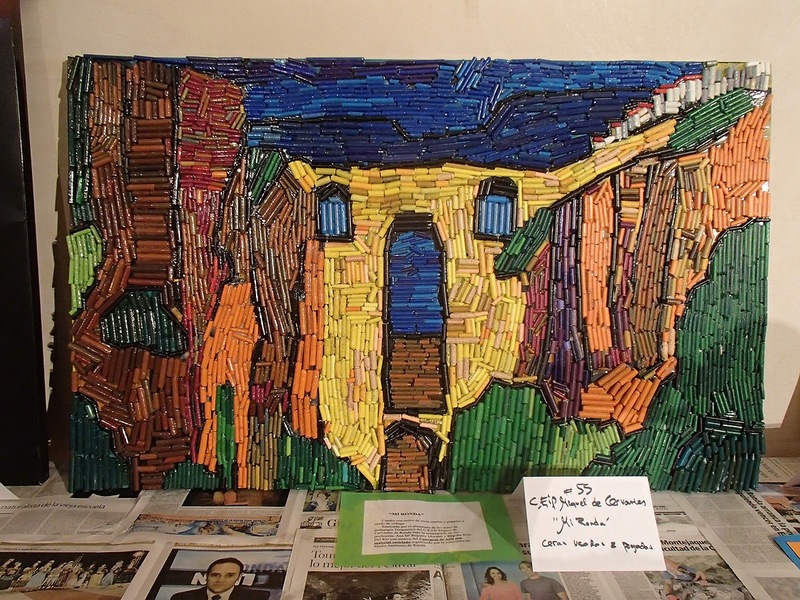 Called ‘La Silla de la Crisis’ (the Crisis Chair), her piece was covered exclusively in bad news! Alas, the event has been wrapped up until next year and what remains is to thank all the participants, artists, volunteers, public servants and dog owners who participated. Also a personal thank you to Suzy, Annie, Ruby, Jane and Lala who participated from further afield!